This is why today we live in a world where our richest businessmen and businesses are marketed as “good,” capable of doing no wrong, and all government is marketed as “bad.” In this world, government exists only for the purpose of business owners and we’re told we should just sit back and let the benefits trickle down. Only they haven’t. In fact, the opposite has happened. The rich have gotten richer and more powerful at the expense of everyone else. We’ve seen this before. The late 1800s and early 1900s saw the rise of rich monopolies that hurt the average person. Railroads favored certain large trusts over small farmers.Upton Sinclair wrote The Jungle in 1906 exposing the health violations, labor abuses, and unsanitary conditions of the meatpacking industry. Foods and drugs were mislabeled and consumers deliberately misled. It is all-essential to the continuance of our healthy national life that we should recognize this community of interest among our people. 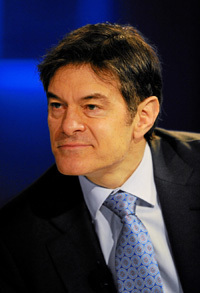 The welfare of each of us is dependent fundamentally upon the welfare of all of us, and therefore in public life that man is the best representative of each of us who seeks to do good to each by doing good to all; in other words, whose endeavor it is not to represent any special class and promote merely that class’s selfish interests, but to represent all true and honest men of all sections and all classes and to work for their interests by working for our common country. This is what everyone wants: A square deal for all. 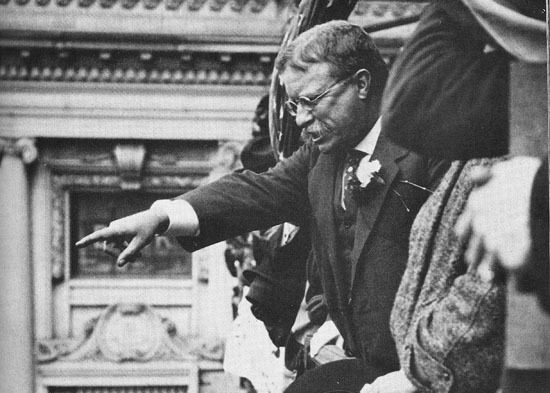 Theodore Roosevelt speaking from the balcony of the Hotel Allen, Allentown, Pennsylvania, 1914 (Lehigh County Historical Society). Side by side with this increase in the prosperity of the wage-worker and the tiller of the soil has gone on a great increase in prosperity among the business men and among certain classes of professional men; and the prosperity of these men has been partly the cause and partly the consequence of the prosperity of farmer and wage-worker. It cannot be too often repeated that in this country, in the long run, we all of us tend to go up or go down together. If the average shrinks, there is not one of these classes which will not feel the shrinkage. Of course, there are always some men who are not affected by good times, just as there are some men who are not affected by bad times. But speaking broadly, it is true that if prosperity comes, all of us tend to share more or less therein, and that if adversity comes each of us, to a greater or less extent, feels the tension. Therefore, as Roosevelt laid out, we need to recognize we have a shared community of interest. The welfare of each of us is dependent on the welfare of all of us. United we stand, divided we fall. In the history of mankind many republics have risen, have flourished for a less or greater time, and then have fallen because their citizens lost the power of governing themselves and thereby of governing their state; and in no way has this loss of power been so often and so clearly shown as in the tendency to turn the government into a government primarily for the benefit of one class instead of a government for the benefit of the people as a whole. Again and again in the republics of ancient Greece, in those of medieval Italy and medieval Flanders, this tendency was shown, and wherever the tendency became a habit it invariably and inevitably proved fatal to the state. In the final result, it mattered not one whit whether the movement was in favor of one class or of another. In other words, this capitalism and socialism argument that we so often engage in today is a false divide. It’s not owners versus workers. It’s owners and workers andfarmers. When workers and farmers benefit, so do owners. No “class” of people is evil, even if we’re often told that. There are good Muslims and bad Muslims. Good black people and bad black people. Good white people and bad white people. Good business owners and bad business owners. Good workers and lazy workers. We succeed when everyone succeeds, and the role of government when it comes to the economy is to create the conditions so everyone can succeed. We create markets. We can either create them so everyone benefits, or we can create them so a few people benefit. What did the Square Deal look like? 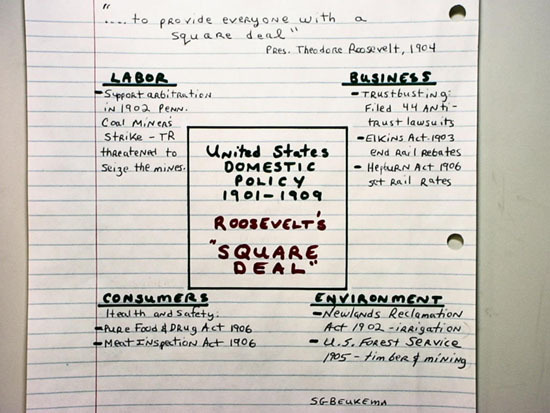 The picture shown is a great visual of Roosevelt’s Square Deal. The four cornerstones of Roosevelt’s Square Deal (Sgbeukema/Wikimedia). My action on labor should always be considered in connection with my action as regards capital, and both are reducible to my favorite formula—a square deal for every man. The Elkins Act of 1903 allowed the Interstate Commerce Commission (ICC) to impose heavy fines on railroads that offered rebates (preferred treatment) to certain industries. Prior to the act, the livestock and petroleum industries extorted rebates and discriminated against groups like farmers. In 1906, Roosevelt passed the Hepburn Act that set maximum rates the railroads could charge and increased the jurisdiction of the ICC. Roosevelt also became known as the “Trust Buster” for filing 40 antitrust lawsuits and breaking up companies such as Standard Oil and the nation’s largest railroad, the Northern Securities Company. Roosevelt also passed two hugely significant consumer protection bills in 1906: The Pure Food and Drug Act and the Meat Inspection Act. The Pure Food and Drug Act recognized that companies often became more profitable by cheating consumers and that these “bad seeds” would crowd out the good companies (Gresham’s law) unless the industry was regulated. It established standards for drugs and led to the Food and Drug Administration (FDA). It also created labeling standards for active ingredients in drugs, and established inspections by chemists. It also allowed seizure of goods found in violation of the law at the expense of producers. Today, we seem to be returning to the days of snake oil salesmen. The Meat Inspection Act of 1906 established standards for meat and ensured that meat and meat products are slaughtered and processed under sanitary conditions. These requirements also apply to imported meat products. All meat unfit for human consumption was banned. During Roosevelt’s tenure, he designated 230,000,000 acres for national protection and preservation including 51 bird reserves, four game preserves, and 150 national forests. This idea of “big government” is a straw man. It allows corporate special interests to get rid of rules that ensure fairness and a square deal for everyone. If corporate special interests said they wanted to get rid of rules that keep our food safe and water clean, no one would buy it. So they create a fiction where government is evil and businesses are good and the “right” thing to do is to fight against the “evil” government that’s somehow oppressing businesses. This is clever marketing. Nothing more. In reality, we prosper together or fail together. If American workers and farmers aren’t being paid enough, they don’t have the disposable income for other services, and businesses suffer. If we don’t have rules that prevent people from cheating others, we create a society of cheaters. If the only people benefiting are the people at the top, we will collapse as a society. What we need is a new Square Deal for everyone. David Akadjian is the author of The Little Book of Revolution: A Distributive Strategy for Democracy. Cross-posted at Daily Kos.